Beata was born in a small suburban town near Budapest, Hungary. Her mother set a powerful entrepreneurial example for Beata by opening her own CPA firm and encouraging Beata to study English and travel. 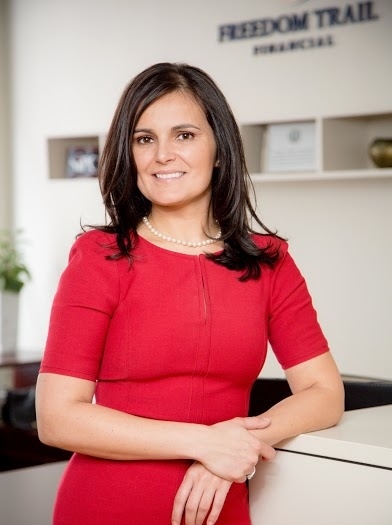 She relocated to Boston, earned her CERTIFIED FINANCIAL PLANNER™ professional certification in 2007, and, after working at a major brokerage firm in Boston for over 10 years, she established Freedom Trail Financial. Beata earned her bachelor's degree in business management from the Budapest Business School and in 2016 earned her master’s degree in financial planning from the College of Financial Planning. The Certified Financial Board of Standards, Inc.
Beata has been featured in Boston magazine as a recipient of the 2010, 2011, 2012, and 2016 Five StarSM Wealth Manager Award. Beata enjoys practicing yoga, hiking, traveling. She also enjoys finding new endeavors such as learning how to play golf or play the piano and scuba diving. Five Star Wealth Manager Award: Based on 10 objective eligibility and evaluation criteria, including a minimum of 5 years as an active credentialed financial professional, favorable regulatory and complaint history, accepts new clients, client retention rates, client assets administered, education, and professional designations. 2,530 Boston wealth managers were considered for the award; 632 (25 percent of candidates) were named 2016 Five Star Wealth Managers. (The criteria provided reflects the most recent year for which advisor received the award. The criteria used, the number of wealth managers considered for the award, and the percentage of those who receive the award, may vary from year to year). These awards are not indicative of the wealth managers' future performance. Your experiences may vary. For more information, please visit www.fivestarprofessional.com. Nicole comes to Freedom Trail Financial with extensive experience in financial planning and investment management research. She is dedicated to superior client service and is passionate about delivering an individualized, tailored approach to financial planning. Nicole is a graduate of Regis College in Weston, MA and holds a bachelor’s degree in Management. In 2015 she earned her professional certificate in Financial Planning from Boston University. She is a member of the Financial Planning Association and a longtime member and patron of the Museum of Fine Arts in Boston. As our Financial Advisor Associate, Nicole’s role is to manage and coordinate all aspects of our clients’ account administration, oversee daily operations, and provide essential support to financial planning and investment management activities. Nicole was raised in Lexington, MA and now lives in the Back Bay, Boston with her family. She enjoys design, music, comedy, fitness, healthy eating, and is an advocate for women and girls in technology and finance. Our Registered Investment Adviser–broker/dealer, Commonwealth Financial Network®, has a vast infrastructure that is built around doing whatever it takes to deliver everything advisors need to serve their clients. The firm’s always–expanding resources help ensure that we can deliver the best possible guidance and the prompt, personal service you expect and deserve. Dozens of experts in estate planning, taxation, risk management, business planning, charitable giving, and retirement planning are available to consult with us to ensure that the recommendations we make are the right ones for your financial situation.